Well summer is finally in full swing here and of course that means lots of time spent hanging out with friends, going on vacation, or relaxing by the pool or at the beach. It is also a time where no matter where you are there is usually lots of music around, especially at festivals. No matter what your preference for music, there seems to be a festival geared for everything. For myself, for 24 years there was a festival that seemed tantalizingly close but yet remained elusive to me for all that time. Close because I read about it so much, heard a great deal of the music from it or even watched videos of it for years and felt like I understood what it must be like. But elusive because distance and one reason after another seemed to scuttle any possibility of really knowing what it was like. Year after year went by and I began wondering if I would ever get my chance. But in 2011 I finally made it. 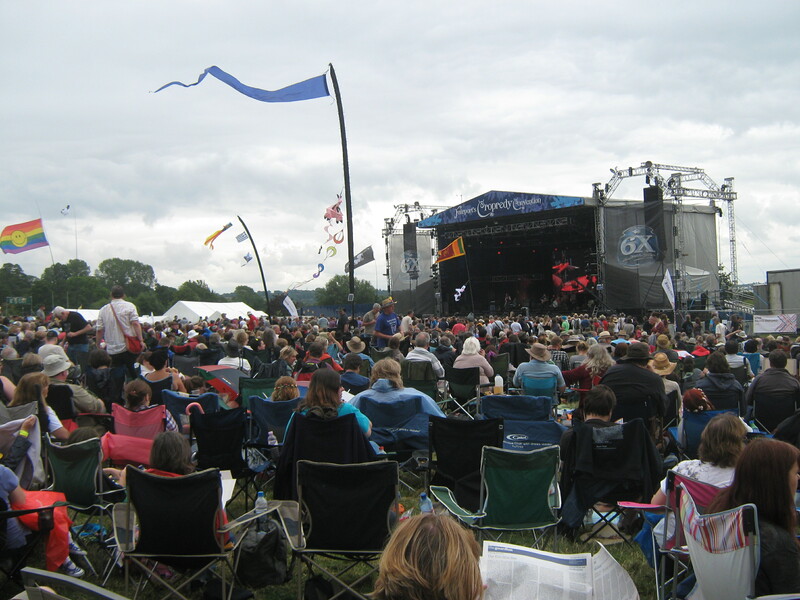 This is my story of how I came to be standing on a field in the small village of Cropredy in Oxfordshire England for that festival, put on and organized by my favorite band, Fairport Convention. Way back in the very first installment of this blog I alluded to this moment, but first a little tale as to how this all started for me is required. The year was 1987; I was a sophomore at Assumption College in Worcester, Massachusetts. Worcester was then, and still is now a faded post war mill town. While I can’t say it was a bustling metropolis, it did have its fair share of things to do; a couple of great museums, several other colleges in the area, but the one thing we were blessed with in Worcester was the Centrum, a new arena that promoters seemed to be using to book concerts for at the time rather than the decaying Boston Garden. In my four years at Assumption I saw many top bands at the Centrum. At that time my musical pedigree was, shall we say, fairly typical of a 19 year old suburban New Jersey kid as I have alluded to in other installments. While in college I moved on to a prog-rock phase, with Deep Purple, Emerson, Lake & Palmer, Yes and The Moody Blues becoming the new favorites. New music was barely on my radar. I thought prog-rock was superior to say, Elvis Costello, R.E.M or U2. It wasn’t that I had a problem with other people liking them, I just smugly thought what I was listening to was far superior. It was at that point in November of 1987 that my roommate Rich decided we should go to a Jethro Tull concert at the Centrum. Of course I knew Tull and they certainly fit right in among the other prog bands I was listening to so I thought sure, let’s go. As it happens I remember buying the tickets on the day of the concert, heading on the bus for downtown and going to the box office and completely lucking out because the seats wound up being more or less center stage, about 20 rows back. Later that evening we returned downtown for what I suppose one would call the typical arena rock gig. Merchandise was purchased and we patiently waited for the lights to dim with the various smells of an arena show wafting around us. When the lights went down it was meant for the opening act, a band I had never heard of before. A quick consultation to the program told me they were called Fairport Convention and it was the proverbial story of a singular moment which changed my life. I wish I could remember what song they opened with, because right away I knew I was hearing something that resonated deeply with me, and reminded me of sounds from my childhood. I grew up in an Irish household. Dad had the Irish last name; Mom was born and raised there, in Donegal as I mentioned in Part 5. I have always been proud to be Irish, but despite having traveled there prior to 1987 I did not yet understand the culture, and what makes it so special. It would not be a stretch to say that Irish music, much like a lot of the other music outside my own very narrowly defined spectrum meant absolutely nothing to me.But on that November night when I heard the unmistakable sounds of folk music in this big arena, I was pleasantly surprised. Folk music can have a drummer and a bass guitar? You can use an electric guitar and sing a ballad? The violin can be electric? Such thoughts had never crossed my mind. I remember thinking on the spot; this is like Dad’s old Clancy Brothers records…but louder and faster. Reading the program again gave me more details. Interesting, they have been around for (at that point) 20 years, why have I never come across them before? Oh-this guy Dave Pegg plays with them and Jethro Tull (as he was doing at the time). What on earth is that long neck guitar/mandolin looking thing that one guy is playing? It was Maartin Allcock playing a bouzouki, an instrument unknown to me at the time. Simon Nicol’s deep resonating voice was singing old folk songs. I was at a rock arena hearing folk songs and liking it. Why didn’t Ronnie Drew of The Dubliners sing like this guy I wondered. Why didn’t Irish fiddle players jump around the stage like this guy Ric Sanders does with his? The drummer, Dave Mattacks was obviously a great player as well and expertly kept it all under control. I also remember thinking rather naively that I did not know the English even had their own folk music! So many more thoughts were in my head. What I remember clearly the most however is simply how much fun they were having as a band. There were lots of smiles and the enjoyment of playing with the spirit of having nothing to lose. Just play the music with no pretension. As Simon Nicol put it years later in describing how Fairport operates-take the music seriously, yes but don’t take yourself seriously for God’s sake. They went down very well I seem to recall as a result of that attitude, but even if they had been playing for only me one thing was clear. The night was a revelation and a way forward for me musically. Most everything else I was listening to no longer seemed as interesting to me anymore. I do not recall the first time I saw the majestic ship Peking, which has been berthed at the South Street Seaport in New York City since the late 1970’s. I may have seen it on some school or family outing at that time, but it was when cousins opened a shop at the revitalized Seaport around 1983 that I started going there on a regular basis. My mom was doing the books for the shop, and at one point my sisters were working there as well, so there were numerous opportunities to leave the suburbs and go to downtown Manhattan to walk the cobblestone streets around Schermerhorn Row, get some ice cream and visit some stores, all the while surrounded by the pungent smells of the nearby Fulton Fish Market. More than anything though, I remember that even as a teenager, no visit to the Seaport would be complete without crossing over South Street and under the FDR Drive and heading over to the piers. Then, as now, directly in front of you on the pier is the Ambrose Light Ship, its bright red hull and Fresnal lens on top of its mast drawing you over to look. Off to the right, behind a large obstruction is The Wavertree, a fine old sailing ship in its own right originally from England. The obstruction to the Wavertree, dwarfing it in height, length, and just about every other category is of course the Peking, whose black hull and enormous masts take up almost the entire length of the pier. Whether it was in 1983 or today in 2013 every visitor to that part of Manhattan turns their head to gaze at this wonder of a bygone era. So it has stayed moored at the Seaport, year after year in the same spot, through rain and snow, brutal summer days, and even hurricanes, much like the conditions it no doubt experienced in its years as a working vessel since being built in Hamburg, Germany in 1911. Over the years since I started going to the Seaport I began learning more about the Peking’s history. 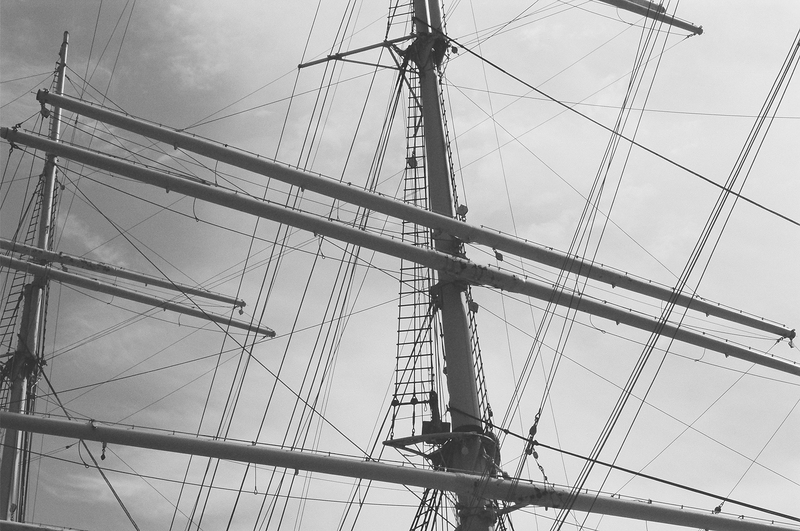 The first thing that became obvious to me was, why a sailing ship in 1911? The Titanic’s maiden voyage was in 1912, which despite its demise, was certainly of its era, technology wise. 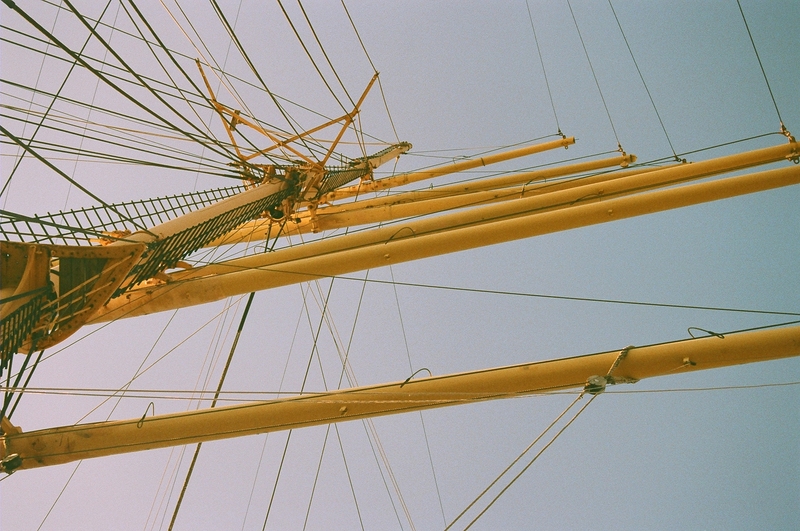 But this four-masted barque built in that same era was a bit of a mystery to me. Of course the museum had the answer. The Peking and her sister ships (the so called Flying P-Liners) were used primarily in the nitrate trade on routes the new fangled steam powered ships had difficulty covering. Of these there was no route more perilous than a trip around Cape Horn. So it was on that route she spent much of her early life, with a slight interruption during World War I, when she was given to the Italians in war reparations, before they in turn sold her back to the original owners to continue the nitrate trade. Around this time in the story, a man named Irving Johnson came to serve aboard the Peking. Johnson, a Massachusetts farm boy who dreamed of the sea made a film about his 1929 voyage on board the Peking, ‘Around Cape Horn.’ When her life as a commercial vessel was over, she was purchased by the Royal Navy as a training ship and renamed Arethusa II, and then Pekin.